Coming up with inspired birthday presents for my husband is a challenge. I started with books, music and toiletries, moved on to sports kit and gadgets, and graduated to ‘experiences’. You name it, he’s done it – truck driving, zorbing, sand-yachting, hovercraft racing, indoor sky diving, segway rallying, flyboarding. I had drained the ideas well of actiongiftsformen.com dry. I needed a hefty dose of inspiration … fast! 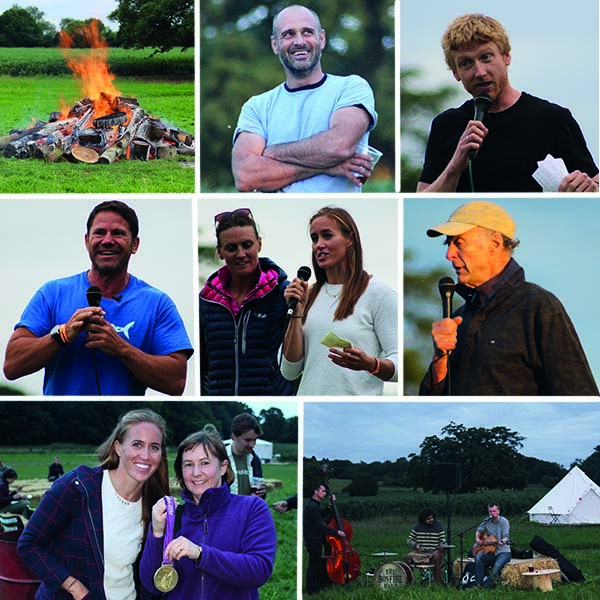 Cue the first-ever Transglobe Expedition Trust Campfire event, where an influential line up of adventurers, explorers and Olympic gold medallists enthralled us with invigorating tales of daring deeds and extreme physical challenges. The over-riding theme of the evening was to get off your backside and grab a slice of life. While I am highly unlikely to trek the length of the Amazon (Ed Stafford), look into the eyes of a sperm whale (Steve Backshall), traverse the globe on its polar axis (Sir Ranulph Fiennes) or train for 6 hours a day to achieve Olympic glory (rowing gold medallists Heather Stanning and Helen Glover), the concept of a ‘microadventure’, as outlined by author/adventurer Alastair Humphreys, was appealingly do-able and provided the spark of an idea for my husband’s upcoming birthday. 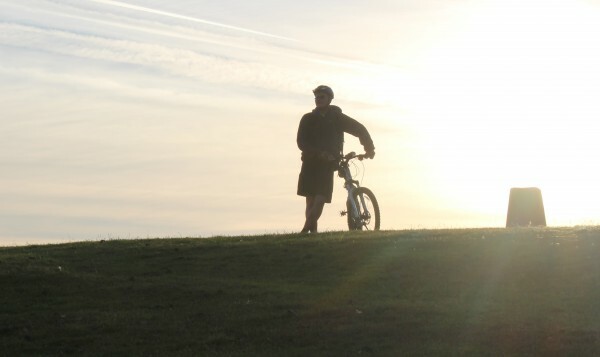 Essentially, a ‘ microadventure’ involves doing something outside your comfort zone, somewhere you’ve never been but close to home – a cheap, simple, short and effective means of breaking out of the same old, same old. 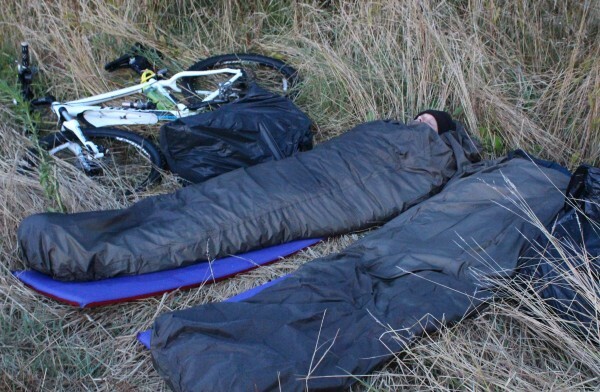 The present was simple to wrap – a bivvy bag and a promise of a microadventure to come. 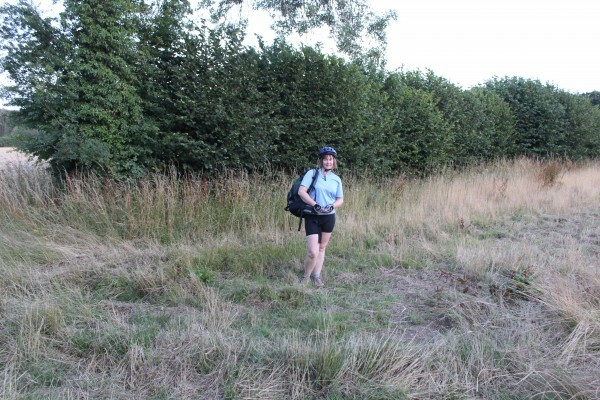 Alastair has a full year of microadventure ideas on his website, but the next one on his list at that time – sleeping without a roof on the night of the next ‘blue moon’ (31st July) – was simply meant to be, as my husband is a Manchester City fan. While my colleagues were hilariously horrified at the idea of ‘sleeping on a hill’, my husband was predictably delighted with the idea. 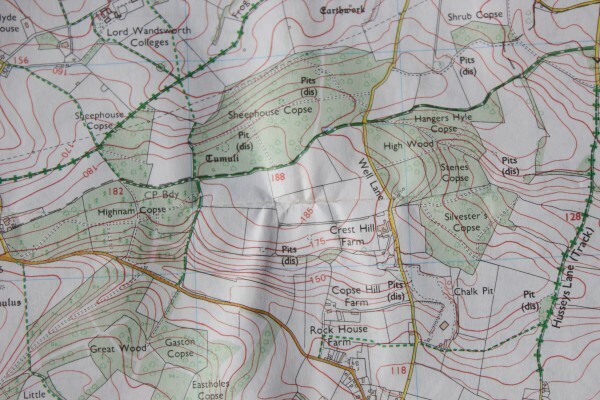 So, on the evening of Friday 31st July, we got out our bikes, had a quick look at the OS map of our local area for contours and greenery (and a pub – there had to be some perks if I was tagging along! ), and set off into the unknown. I admit that I double checked the weather forecast before setting off, as I do draw the line at sleeping without cover in torrential rain. 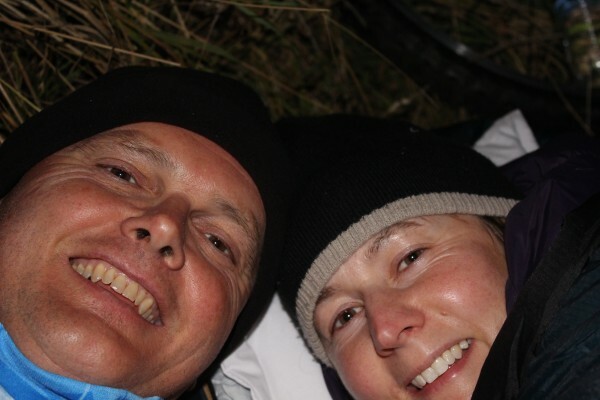 … but as we had deliberately picked this date to see the moon, we decided to look for somewhere more exposed. 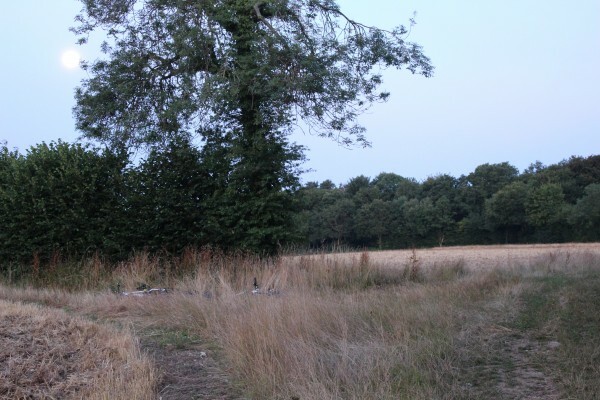 We found the perfect spot between two already-harvested fields, where the long grass at the field edges had been flattened to make a cosy mattress. 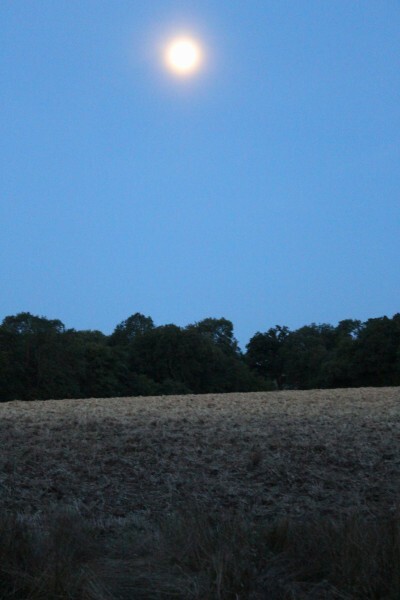 The moon was already high in a perfectly clear summer sky, shedding a slightly surreal light over the golden cropped field. I was a little disappointed to discover that a blue moon isn’t actually blue (nor is it made of cheese!). Without getting too technical, the modern definition of a blue moon is a second full moon in a month (which doesn’t happen that often). Having picked our spot, we raced off to the pub to grab something to eat before they finished serving food, and caught a spectacular sunset en route. Fed and watered (stuffed and tipsy), we returned to ‘our’ field to settle down for the night. 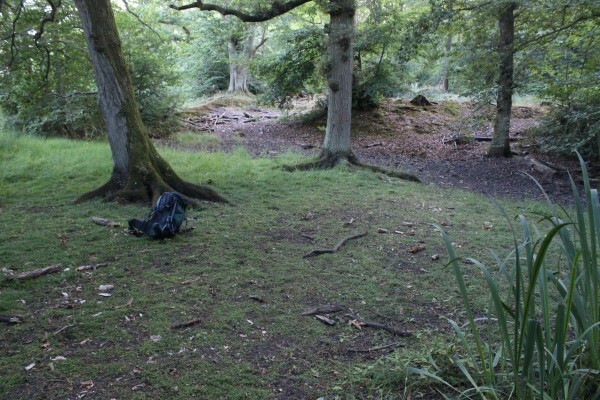 We hadn’t brought much with us – sleeping bags (of the 4 season variety, as the nights were already turning ridiculously cool), thermarests and of course the newly acquired bivvy bags. I’d also brought along a couple of ‘luxuries’, namely a small blow-up pillow and my toothbrush! We didn’t need our head torches as the moonlight was phenomenally bright. 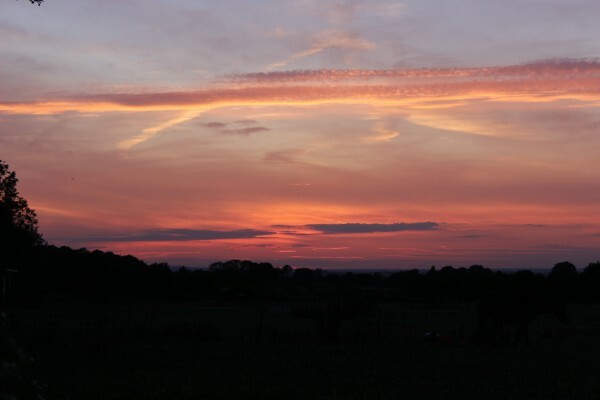 Once we’d put our rucksacks in bin bags to prevent them getting soaked with dew and climbed into our sleeping bags (a process that seemed to involve considerably more faffing on my part than my husband’s), we let the silence of the night envelop us. Settled in our bivvies. Woolly hats in July?! There were a few eerie nocturnal calls and every rustle of vegetation was amplified in the stillness; nevertheless, I soon drifted off. I’ll be honest, it wasn’t the best night’s sleep! I tossed and turned quite a lot, and was eventually woken by the persistent harsh barking of a fox at 4.30am. At this point, my bladder prompted me to vacate my cosy cocoon and I struggled out of my wrappings. Stumbling into the hedgerow to complete my ablutions, I was impressed by how well camouflaged we were in the long grasses. As s I rounded the hedge separating the two fields, I was amazed to still see the moon in all its glory, despite the lightening sky. I wandered around the field a bit, waiting for my husband to wake too. This is no time for a lie in! 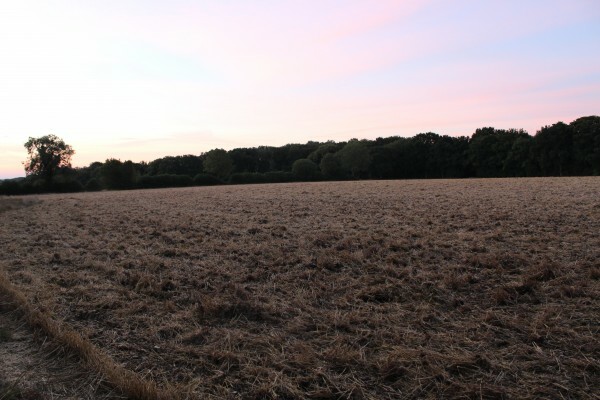 He eventually stirred at around 5.30am, as the sun began to rise, and a deer appeared at the far side of the field, eyeing these strange interlopers in his usually private domain. Fuelled with cereal bars and fruit, we set off on our bikes before anyone was any the wiser that we had borrowed their field for the night. 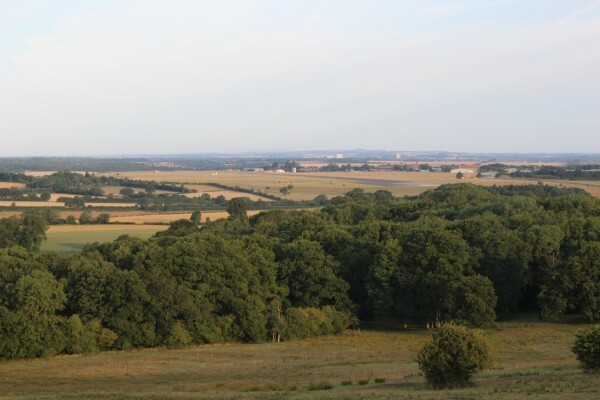 We took a longer route home, revelling in the views of the surrounding countryside as the sun warmed up the landscape. Not being a natural early bird, I was enjoying the solitude of this ridiculous time in the morning, when even the earliest of dog walkers hadn’t yet emerged. We were back home by 9am, invigorated at having done something a little less ordinary. 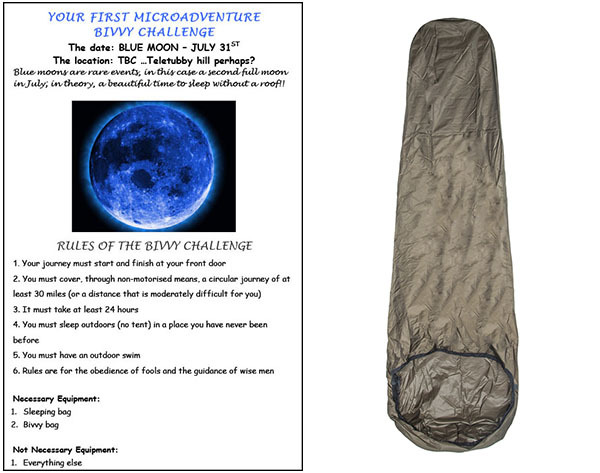 Now that we have experienced our first microadventure, I sincerely hope it won’t be a ‘Once in a Blue Moon’ experience (sorry, couldn’t resist!). If you’re fed up with the same old familiar routines, then I urge you to give it a try. There are loads of ideas on Alastair Humphrey’s website, and his blog is fabulous reading, so take a look, and let me know if you give it a go! This is SO cool! What a great wife you are! Love this – well done. Funny enough, that what I did for my birthday. We’ve been out several times since then and even slept out during the perseids meteor shower and feel asleep, while watching shooting stars. Best of luck with further adventures (of the micro type). . This sounds fantastic. I’m planning to do our first microadventure this weekend with my kids. The more stories like yours that I read, the more excited I become! Brilliant! I really hope the rain holds off for you. You’ll love it. I look forward to reading how it goes. Lucky no helicopters on Night Patrol! !